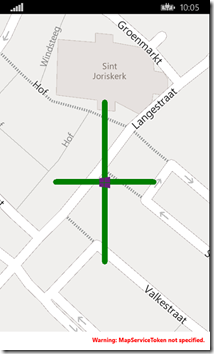 With the Windows Phone 8.1 SDK came (yet again) an improved Map Control. This brought, among other things, the MapIcon. In ye olde days, the map could only draw lines and polygons natively – when you had to draw icons you had to add child objects to the map itself, which were drawn by the UI thread and not by the map. This is slower and eats more resources. The new map still offers this possibility. And sometimes we need it, too, for a couple of reasons. First of all, a MapIcon can only display an image and an optional label. 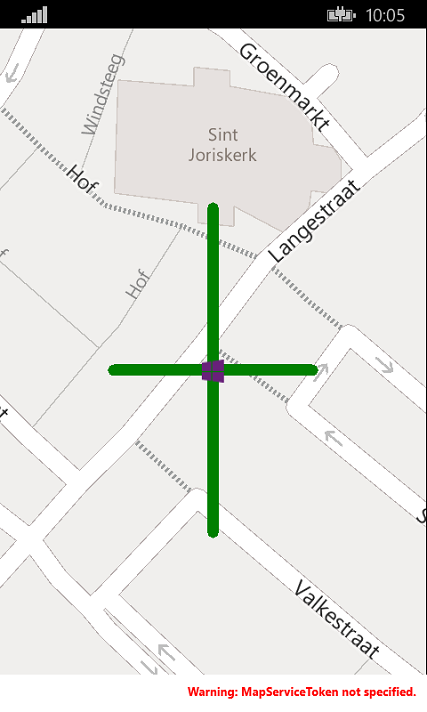 Second, MapIcons are drawn on the map using a ‘best effort’, which mean overlapping icons don’t get displayed at all and – worse – if you query the map, using the FindMapElementsAtOffset method, they are not found either. So in some cases we just need to resort to drawing XAML elements by adding to the map’s Children collection – an option, which luckily has been improved tremendously as we now, for instance, can data bind these elements using the MapItemsControl, as explained by my smart fellow MVP Shawn Kendrot. Before 8.1, we needed the Windows Phone Toolkit for that. But to my dismay I also discovered that the MapTapped event does not fire either when you tap on a location where a child object is displayed. Ergo – if you tap on the cross where the Windows Phone logo is displayed, nothing happens. So how am I to find out what’s underneath there? And because the events never fire simultaneously, you will see the map finds one PolyLine when you tap on a line just next to the symbol, will and it fill find two lines (the crossing of both) when you tap on the symbol- but never will you get a double hit from both events. And thus we can find everything on the map, provided you attach the right methods to the right events. The MapTapped/Tapped combo of the map is an odd one but once you know how to do it – a few extra lines of code does it all.